Four funny and fabulous short plays interspersed with musical items and a dance performance. 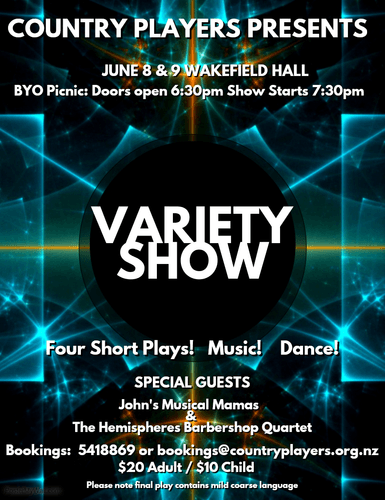 Special Guests 'The Hemispheres' Barbershop Quartet, 'John's Musical Mama's' and Empire Dance Company. BYO Picnic - bring your own food, drink, cutlery and crockery and enjoy 2 hours of entertainment whilst dining by candlelight. Doors open 6:30pm. Show starts 7:30pm. Tickets available from (03) 541 8139 or bookings@countryplayers.org.nz.